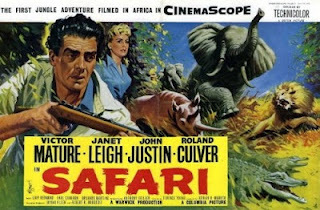 Barely able to move I lay on the settee today and watched 'Safari' starring Victor Immature and the lovely Janet Leigh (a few years before Hitchcock had her stabbed by a psycho in the shower). Amazing film on many counts, not least because the African bearers, despite having a rich musical heritage of their very own, chose to sing a Jamaican calypso as they bounced across the plain on top of a truck. The lyrics mentioned every African animal and just by chance they all went past when their name came up. Also featured a rhino charging mercilessly at a shop window dummy and tossing it in the air. Those rhinos, eh. Vic was bent on revenge as the Mau Mau had killed his (very annoying) son. All that was left was the toy tank Vic had given him. Needless to say, Vic took that tank on safari with him. Janet Leigh went down the river in a bright yellow dinghy for a lark and was menaced by dozens of crocodiles before going over a waterfall. She survived that only to be menaced by a dozen more crocodiles. We've all had days like that.